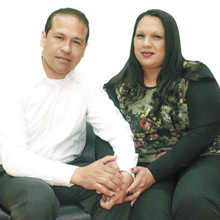 Ruben started to participate in the meetings at the UCKG – because he had a sickness in the stomach whose diagnosis the doctors couldn’t find. His co-worker invited him to the HelpCentre, and after one week, Maria shares that she saw changes in his character – he asked her for forgiveness and bought her flowers. However, in the beginning, despite his good efforts, when he would ask for forgiveness, he would do the same thing a week later. She had a hard time trusting him. Time passed and not only did that change, but she saw many more changes in him, so she also started attending the HelpCentre to fight for her own battles.